When I was little and growing up in Los Angeles, my parents would take me and my four siblings to the beach. These were significant outings: pails, shovels, toys, sandwiches, chocolate Ding Dongs, thermoses full of lemonade and warnings from my mother not to go in the water for twenty minutes after eating. I remember something else well: my father would always go to the back of the beach and start moving funny. He went go through an elaborate series of movements for hours on end. Even more awkwardly, this was the early ’70s and he was from Argentina, so he was wearing a Speedo. We kind of pretended that we did not know him. He didn’t seem to mind, and appeared at peace throughout these routines. He was practicing Tai Chi. The Tai Chi continued to follow me as I grew up. At Little League baseball games, AYSO soccer games and school events, my father always found a little downtime to practice Tai Chi. Sometimes my friends asked me about it, but over time we just brushed it off as a bit of eccentricity. No one else showed any interest in Tai Chi and my father never tried to push it on us. In retrospect, I think that Tai Chi was his escape, his private oasis of tranquility in juggling the responsibilities his free spirit had taken on in growing up and raising a family. My father was also a runner. He was always interested in fitness and eating a healthy diet. I guess he picked up running as exercise and eventually he invited me to join him at 10K races. I sometimes won age group awards and got kind of hooked. For two or three years when I was 12 through 14 years old, we entered races frequently and both increased our distances until we both ran marathons. After the races, we’d often find a local market that sold kefir, a fruity yogurt drink which we both enjoyed. Eventually, though, I lost interest and moved onto other pursuits. However, my father kept running and ran several more marathons. I forget when, but at some point my father had a running injury which he had trouble overcoming. To replace running, he found race walking. Now, I don’t know how many of you have seen someone properly race walk, but it’s a series of movements marked by gyrating hips. Not exactly what is perceived as “normal.” Nevertheless, my father sped down our street moving his hips in a manner most 60-year-olds would never fathom. He had become a practitioner of both Tai Chi and race walking. However, like Tai Chi, race walking was his outlet and we respected it, although no one else in the family showed any interest in these pursuits whatsoever. In my late teens, I started cycling and spent six years racing bikes. I made the 1988 Olympic Trials and raced for the Costa Rican National Team in the Tour of Mexico. This was a very enjoyable outlet for me, and my parents often came out to watch my races. Just like when I was a child, my father could often be seen practicing Tai Chi or race walking, still apparently oblivious to the outside world. When I was 25, I realized that I was making so little money racing bikes that I needed to find a career. One of my cycling teammate’s girlfriend was a mortgage loan officer. She helped me start a career in real estate, which evolved over 25 years to my position today as CEO of American Homeowner Preservation, a socially-responsible hedge fund. AHP purchases pools of nonperforming mortgages from banks at big discounts and then provides sustainable solutions to keep families at risk of foreclosure in their homes. I have often taken risks in my career, experiencing both success and failure. Running has been a great outlet to calm my body and mind through these often self-inflicted challenges. I have competed in many events, from 5Ks to 50-mile trail races. I often train alone on trails. The solitude and rhythm of running in the woods for hours on end is very refreshing and puts life’s ordeals in perspective. In 2010, I was running faster than I had in years. I was training with Earth Drummers, a group of local elite runners, many fresh out of college. I won the one trail marathon I entered that year. However, I injured my hamstring and repeatedly and unsuccessfully tried to come back. The injury kept returning. Finally, early in the summer of 2011, I decided to find another outlet to refresh my mind and restore some rhythm to my life. On the latter part of a three hour run on which my hamstring throbbed and I started to shuffle, something in my mind told me to try race walking. I tried right then and there. To my surprise, I was able to get my heart rate up into a target training level. I entered a local 5K three weeks later and won the walking division. I still had a lot of learning to do in order to perfect my race walking technique. I was particularly challenged because many of my body’s muscles stiffened after years of cycling, running and working at a desk. To be a great race walker, you need flexibility in order move with grace. You need to be nimble, like a cat. I tried stretching on my own in the conventional stretching manner, but did not see much progress. However, in July 2011, I decided to sign up for a series of Tai Chi classes: once again, it just flashed in my mind. Just like everyone in life, my father experienced his share of challenges. In 2005, he was diagnosed with stage three melanoma. The cancer started on his skin but had entered his bloodstream. His doctors said that his life expectancy was six months. He also had a bad reaction to a cancer treatment early in 2011 and was hospitalized and in rehab for almost two months. 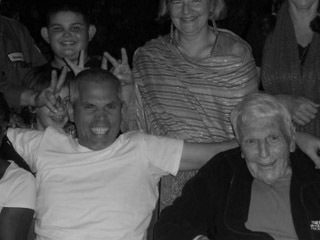 However, in July 2011, we celebrated his 91st birthday. That weekend, I joined him in a workout with his race walking club, which included several competitive race walkers. We also had a party that evening which was attended by several of his friends from Tai Chi. Just like those days 40 years ago at the beach, my father appeared immune to what the world expected and continued to live a vibrant life. As I have aged, in Tai Chi and race walking I discovered the same oasis of tranquility which my father found years ago. He never suggested it and, even if he had, I would not have listened. Instead, he lived his life and set an example which was in my mind when I needed to find it.